The picture below is a pretty special one to me. 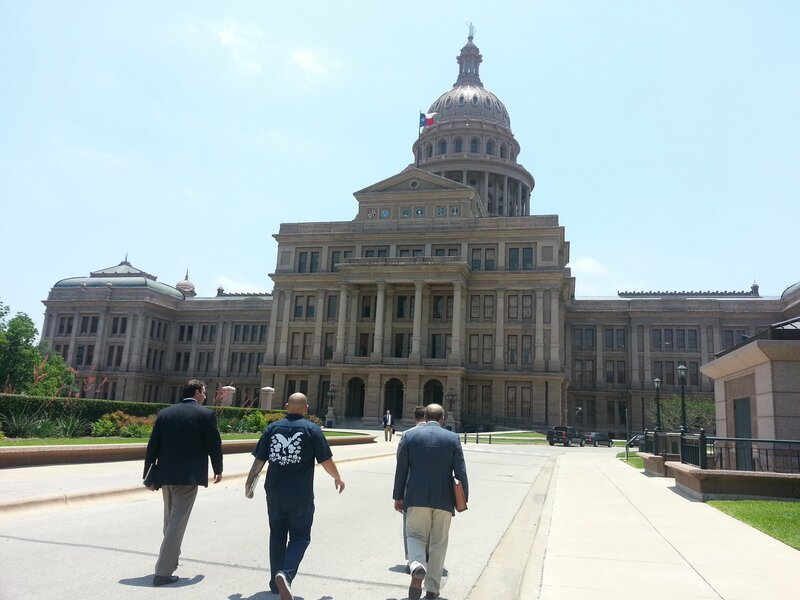 Not only was I significantly younger and thinner, but it was taken alongside Texas craft beer lobbyists Jim Dow, Mark Homer and Jason Smith (Jim and Mark still represent Texas craft brewers today, Jason now works for the University of Houston) as we marched to the Capitol on May 17, 2013. 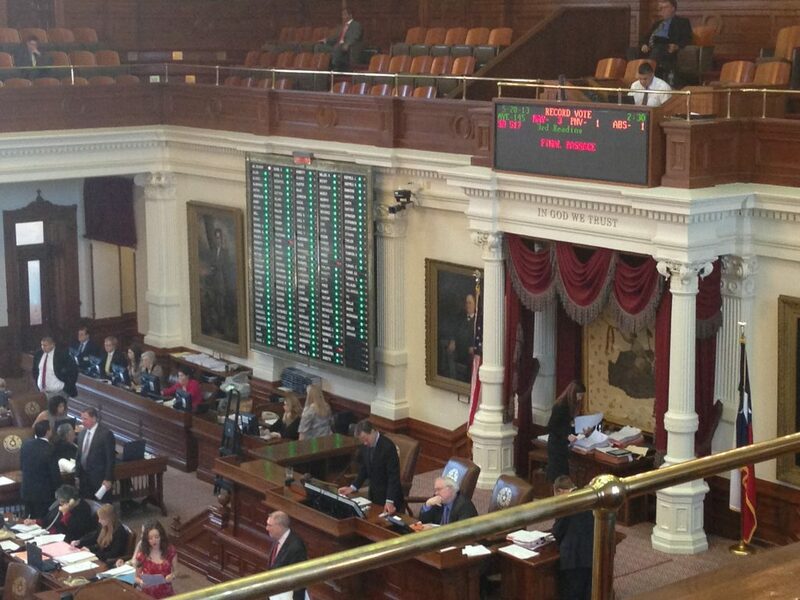 That day we witnessed the Texas House of Representatives pass on 2nd reading SB 515, 516, 517 and 518, which allowed Texas brewpubs to sell their beer for wholesale and for production brewers to sell beer directly to consumers for the first time. This legislation was a game changer in Texas. Since then we’ve seen the number of brewers and the amount of beer they produce absolutely explode. This was the first (and unfortunately the last) meaningful, positive craft beer legislation passed in this state since 1993, when brewpubs were first legalized. Just a few days later on May 20, the House passed the package on 3rd Reading (seen below) and they were on their way to the Governor Perry’s desk for signature. It was 4 years ago today, June 14, that the bills were officially signed and became the law of the land in Texas. For me personally, it was the culmination of a 6-year effort to loosen the laws, which meant a lot of time spent at the Capitol acting as amateur lobbyist and getting an up-close-and-personal civics lesson on state government. Some days were long, the vast majority of them were discouraging, and it probably took a few years off my life…but I would do it all over again if I had to. In celebration of this momentous occasion, we at Freetail have decided to dub Saturday, June 17 as Texas Craft Beer Independence Day. To mark the occasion, we’ll have games, music and of course beer at our S Presa brewery (which was only possible because of these laws). For more details on the celebration, click here for our Facebook event. As you may know, the 2017 session has not been as kind. Even as this post is being written, we are waiting to see if Governor Abbott will veto HB3287, which is opposed by us Texas craft brewers (you can read all about it here). While craft beer still battles on in the marketplace and statehouse, we can say we’ve come a long way. The market for craft beer has never been stronger and Texas craft brewers are more organized than ever. The future looks bright, not just for Freetail, but for all Texas craft brewers! Thanks to all of you for your continued support of Texas made, independent craft beer!